Had fun researching some of the most bleak and obscure places on the planet. My first story for Outside Magazine. Can an asteroid-impact zone or the shores of a lava lake be beautiful? Absolutely. Bleak can be beautiful—at least when Mother Nature or mankind has gone awry. Taking in the juxtaposition of disfigured trees in a desert, rare beasts on a barren island, a house engulfed in lava, or a brillant white desert used for testing end-of-the-world missiles, one is compelled to redefine the concept of beauty. Here are five rare apocalyptic places that will get inside your head, and stay there, long after you’ve returned to pretty civilization. When the Soufrière Hills volcano erupted in 1995, it buried two-thirds of this tiny Caribbean Island (it’s just ten by seven miles wide), including Plymouth, its former capital. Luckily, most of the people in the affected area were safely evacuated. Recently, islanders who have relocated to the island’s unaffected northern side have begun offering tours around the zone of destruction. Gingerbread Hill, on the lush northern coast, is a secluded jungle retreat of villas, some overlooking the sea, that offers full-day tours ($65) to explore places like the abandoned Montserrat Springs Hotel and the old airport. Alternatively, get a bird’s-eye view of the devastation on a 45-minute helicopter ride or sail around the exclusion zone. Stick around to try Montserrat’s excellent diving, hiking, birding, and spearfishing. Get there: Fly to Antigua, and then take a 20-minute flight to the town of Gerald on Montserrat or a two-hour ferry from Little Bay Harbor in Antigua. White Sands is the world’s largest gypsum desert. (Gypsum is the mineral used to make chalk.) It’s 275 miles of sand so blindingly white that it looks like you could be in Antarctica. The entire area was under the sea 100 million years ago, but even though the ocean left this place for dead, its apocalyptic reputation stems from being the site of the first nuclear bomb test. The explosion occurred on the Trinity Site, 30 miles from Las Cruces, and is open only two days each year: the first Saturday of April (April 5, 2015) and the first Saturday of October (October 3, 2015). The visitor center, open six days a week year-round, has an eerie outdoor missile park. Since you might need some cheering up after this site, take a guided tour of Lake Lucero (the source of White Sands’ 4.5 billion tons of gypsum), see fossilized animal footprints at the bottom of Lake Otero, or hike the five mile Alkali Flat Trail. Get there: Fly into Albuquerque and drive 240 straight-shot miles south to Alamogordo, or land in nearby Las Cruces and drive 30 miles. The asteroid impact that may have destroyed the dinosaurs 65 million years ago is now a network of swimmable caves called cenotes. They’re peppered throughout the Yucatan Peninsula, but Chicxulub, about a three-hour drive west of Cancun, is where scientists believe the main impactoccurred. “Half of the crater rim is undersea; the other half forms the cenotes [sinkholes] which we have all over the peninsula,” says Yuanita Stein, editorial director for Yucatan Today. Base yourself in Cancun (if you can stand the crowds) or stay closer in Merida, the Yucatan capital. Pop into the museum in Merida to see a history of the crater, and then dive on in. Just be sure to go with an official guide since not all cenotes are safe for swimming. Get there: Fly into Cancun, and then take a nine-mile bus ride to Dos Ojos or drive west 30 miles to Merida. Wrangel Island has a curious history. It was one of the only plots of land that avoided glaciation during the last Ice Age, and scientists believe this Arctic tundra is where the last wooly mammoths roamed. Today this 2,900-square-mile island 88 miles off the coast of Siberia is a veritable Galapagos of the Arctic, with unusual plants and wildlife, like musk ox, Arctic fox, Pacific walrus, snowy owl, and the relatively large polar bear population (400 at last count). Only recently opened to tourists—who largely come to see the gathering sites of polar bears—travelers are otherwise forbidden without proper visas and park passes. Outfitters like Heritage Expeditionsfacilitate the process, but it comes at a price: A 15-day excursion costs $11,200, excluding flights. Get there: Fly VIM Airlines direct from Moscow to Anadyr, the port to Wrangel Island. Erta Ale is as inhospitable to human life as you can imagine. As the sun sets, smoke emerges from the cracks beneath your feet and an eerie red glow emits from a gurgling lava lake (one of only five on earth) located in the center of one of the world’s only continuously active volcanoes. San Francisco–based writer Jill Perambi says camping in the Denali Depression, in the northeastern region of Ethiopia, was one of the most intense experiences she’s ever had: “The strong sulphur smell made our eyes water and throat burn, and without headlamps (our main light source was the lava itself), we could’ve easily tripped and fallen into the boiling lava.” Plus, air temperatures reach up to 118 degrees. Take a guided tour, which include stays on the surrounding caldera, but only if you’re looking to push your limits. Get there: Fly into Mekele, Africa, on Ethiopian Airlines. From there, it’s about 80 miles to Erta Ale with a tour on land. The ocean once covered the arid, unforgiving landscape of this desert in southwestern Africa. Sand, dunes, and rock outcroppings now stretch as far as the eye can see, which made it the perfect set for the postapocalyptic thriller Mad Max: Fury Road. Despite the bleak feel, it’s a popular place for sandboarders, as home to the world’s tallest sand dunes, some reaching upwards of 1,000 feet. Check out the hills near Sossusvlei in the Namib-Naukluft National Park, which overlooks Dead Vlei, a 550-year-old petrified forest. 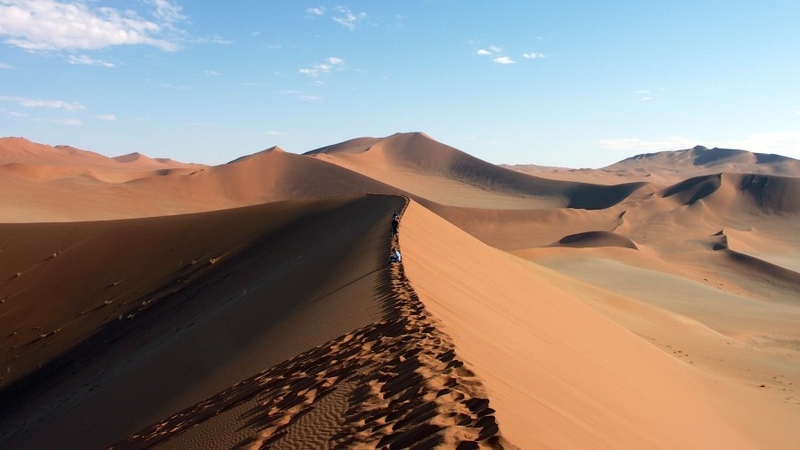 Albatros Travel Africa runs a few duneboard-centric tours, or stay at Sossusvlei Lodge, just at the lip of the park. For bragging rights, hike up the Big Daddy Dune (1,066 feet), the largest sand dune in the world. Get there: Fly into Windhoek, the capital of Namibia. From there, it’s either a six-hour drive or a one-hour air taxi flight to Sossusvlei with your tour company.